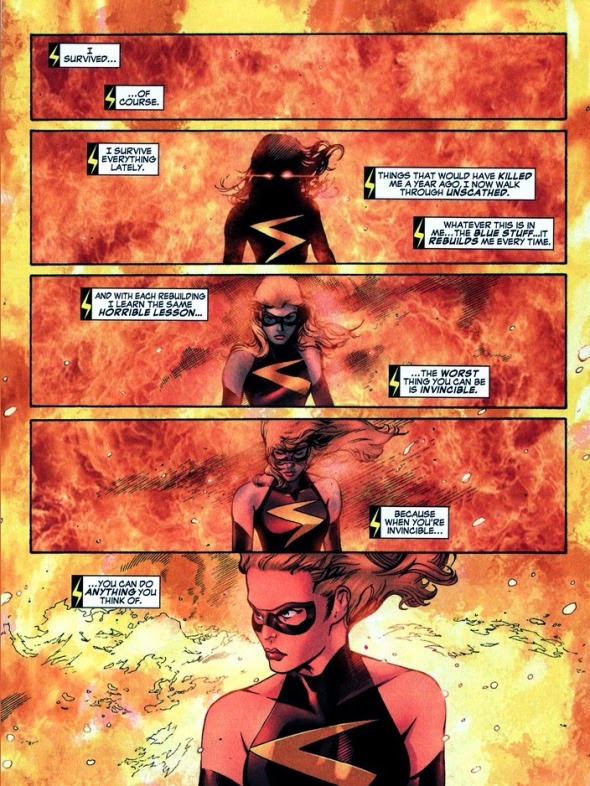 It's A Dan's World: MOMENTS IN COOL: Ms. Marvel "Who's Going To Stop You?" MOMENTS IN COOL: Ms. Marvel "Who's Going To Stop You?" I really need to light a fire under the Moments In Cool feature, and spotlight more of comics best moments, be they pages long or just a couple of panels. As I'm currently trimming back my stash, I'm hoping to kill two birds with one stone, which means one week it could be Captain Carrot, the next Luke Cage. This week it's Ms. Marvel. One habit I just can't break is picking up all appearances of 90's Marvel heroes like Darkhawk and Sleepwalker. In Ms Marvel Vol2 #20 Sleepy not only guest-starred but so did Machine Man, Beast, Silverclaw and Tigra among others - in other words it was a damn good mix. Written by Brian Reed and drawn by Greg Tocchini, Carol Danvers was not about to let her spotlight be stolen. Stepping from the blazing wreckage of the Puppet Master's plans, the woman whose most famous moment is essentially being an appetiser for a pre-heroic Rogue, now thinks about the unlimited potential of her newfound powers. As she walks, lamenting where destiny has taken her, not once does Carol look forward. That is until her perspective entirely changes in the last two panels. Now gazing straight out at the reader, Danvers' issues her challenge. She is destinys puppet no longer, and Marvel's premiere (and now fully aware) female badass is born. Good post. Ms Marvel is always popular with me. This particular ish was discussed on our FF forum last week because we were discussing the Puppet Master and what became of him. I'm right there with ya on the D'Hawk and Sleepy addiction. Captain Carrot? How dare you, Sir! No worries guys, glad you liked the moment! Good timing aye Karl - Puppet Master seems to get around more than a few folk out there would think he does! While Puppet Master vs Ms Marvel does instantly make you think 'Okay so what happens in panel two?' it was a pretty decent read. King - if you've got someone to share an addiction with that always makes the difference in my book!